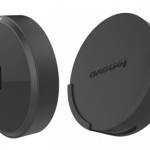 Update: Miracast support has been delayed but Amazon have confirmed that it’s coming soon. 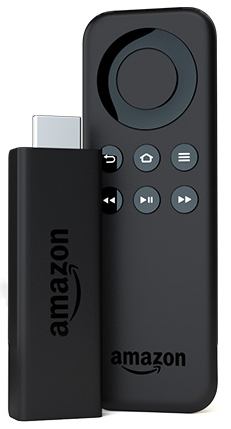 Like Chromecast, the Amazon Fire TV stick can be directed to pull content from the Internet. It can handle protected content from Netflix, Hulu, Pandora, Amazon Video and other streaming services and it’s got a partner app for Android-based phones that allows you to select content. Unlike Chromecast you won’t have the capability of directing content from a PC desktop like you can with Chrome but you will have Miracast – something that Chromecast doesn’t officially support. 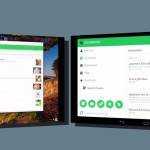 Miracast is primarily a screen mirroring app but can be used to extend a screen which makes it useful for wireless tablet-controlled presentations. Miroring content from a powerful PC can also have advantages if you’re using rare codecs. Don’t expect a Chromecast or Fire TV Stick to handle Hi10p for example. Amazon are pushing the Fire TV Stick as a high-performance solution so it could make it one of the more reliable Miracast solutions at this price level. I’m not sure it supports WiDi extensions though. The unit is based on a dual core CPU (Broadcom Capri 28155, dual-core 2xARM A9) with 8GB of storage and has 1080p and 7.1 channel Dolby Digital Plus support. With dual-antennas it also supports dual band WiFi a/b/g/n operation. There’s even a Bluetooth module inside for HID, HFP, HPP profiles so it shoud be possible to control this over Bluetooth and that’s possibly how the included remote control works. Hmmmm. 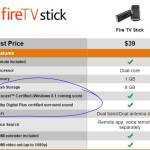 So the FireTV Stick would work just like connecting HDMI cable from the PC to a TV? If so then I would go for it. Chrome Cast doesn’t work for me because I want to duplicate the entire desktop experience to the TV. So far, sadly only a wired-HDMI connection is allowing that for me. I did try a WIDI device from Netgear but that was not a good experience and then the device died on me. Oh, Microsoft is supposed to be coming up with its own WIDI device for $59–I may go for that. Thanks, Chippy. ActionTec Mini2 looks promising. I will see its review. I have 15.6 inch Lenovo running Win 8.1 which has WIDI adapter and that briefly worked with the doomed Netgear one. Miracast is built into all devices running windows 8.1 correct? So will my laptop running Windows 8.1 be able to do screen mirroring with the Amazon fire tv stick? If so, do you think that it will be hard to set up? Nevermind. My device does not support miracast. Not all windows 8 devices have it built in. I think I may get Chromecast in the future instead of the amazon stick.